Buzz is everything. For several months now, J and I have been following the progress of a new brewery as they built their tap room and hyped up their beer. By the time they actually opened for business, J and I couldn’t get there fast enough. 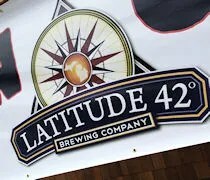 Opening day for Latitude 42 Brewing Company was last Monday. The areas newest brewery is on Portage Road just north of Centre Street in Portage. 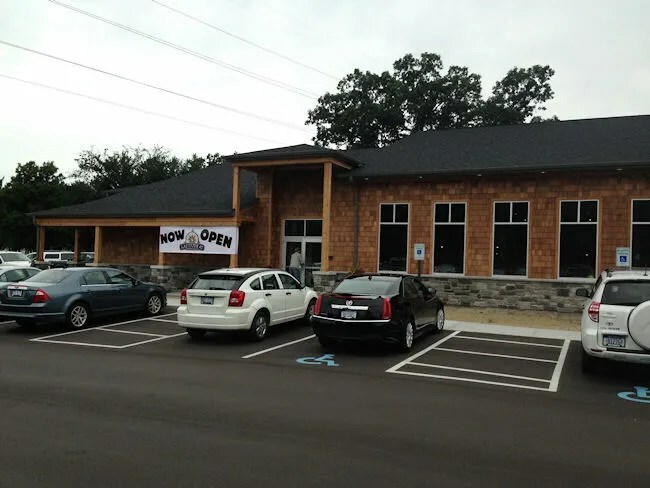 The restaurant/brewery is a brand new building built from the ground up. As soon as J got off work, we got L packed up and headed out the door. A couple of J’s co-workers were going to lunch anyway and when J told them where we were going, we all decided to meet. J’s co-workers beat us to the brewery and tried to get a table. When they told the hostess we had a baby, we were told there was going to be a little bit of a wait. By the time J and I got there, they decided to ask if we would mind one of their big tables. We said it didn’t matter, but on the way back to the table, J pointed out a four top in the corner and asked if we could take that one. It didn’t bother us to squeeze L in between the two of us so that’s what we did. The dining room is pretty wide open at Latitude 42. There’s a nice, big 360 degree bar in the middle and some pub tables in the empty space around the bar. The rest of the building is set up a little more family style with regular sized tables. The thing i noticed is that they probably could have squeezed at least a half dozen more tables in the space, but I like that they didn’t. You don’t feel like the table next to you is right on top of you. 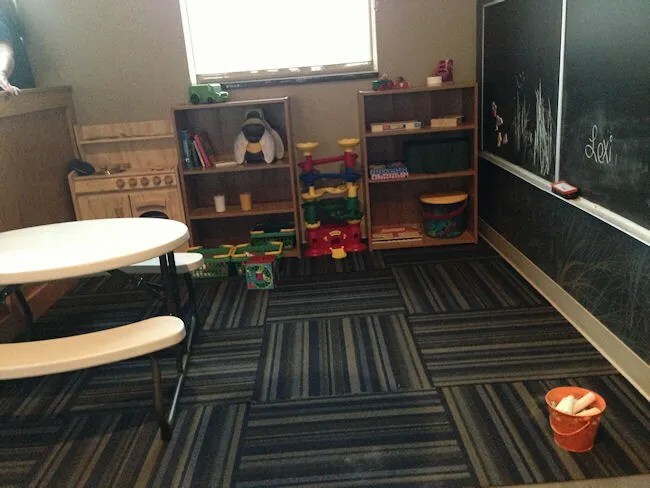 The really cool feature, for parents anyway, is a little play area for the kids in the back corner of the restaurant. We were actually seated at the table right next to it and L took off when she saw the blocks and the chalkboard to play with. Three of the four of us started with one of Latitude 42’s brews. I chose the I.P. EH (IPA…get it?) while J got the Sumpin Light. I honestly don’t remember what the third guy got while his girlfriend stuck to water for a while before trying a glass of white wine. 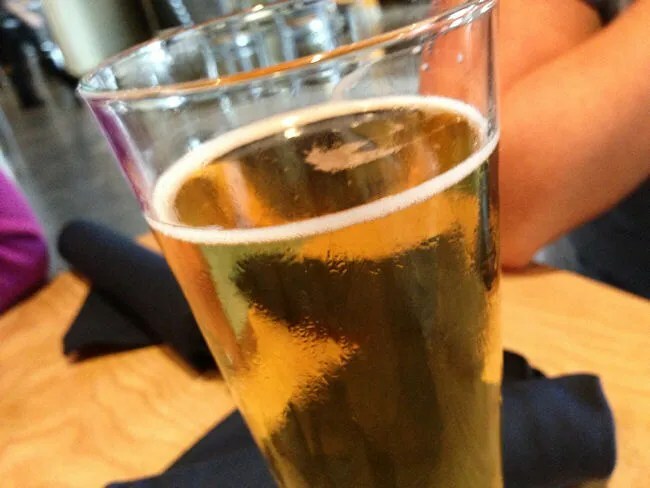 Once we got our drinks, we switched gears to start thinking about lunch. I stuck with the Classic Burger and added Aged Cheddar Cheese. 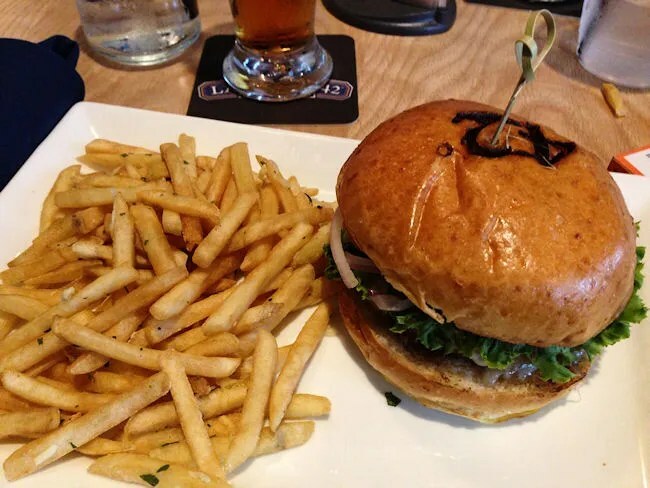 The burger is a short rib blend of Pat LaFrieda Burger topped with lettuce, tomato, onion and served on a fresh baked bun that is branded with a “42” just in case you forget where you’re at. The sandwich was pretty amazing. The burger had just a hint of pink in the middle and the bun was soft, flaky, and slightly toasted. I upgraded my side to the Truffle Fries which cost an extra couple bucks. J was intrigued by the Latitude 42 Beer Cheese Soup. 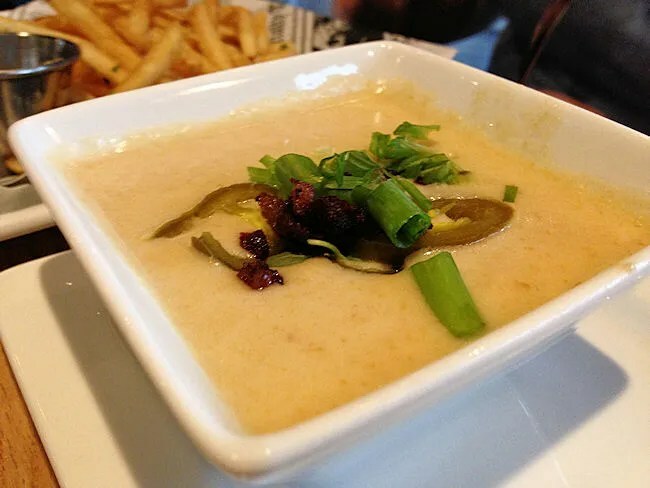 The soup is made with Li’l Sunshine Golden Ale, smoked white cheddar, bacon, chives, and jalapenos. To make it a meal, she added on a side of truffle fries. J said the soup was amazing. Very cheesy with a slight taste of the ale. She pulled most of the jalapenos out, but other than that, really enjoyed it. For L, we went with the Grilled Cheese sandwich. The kids meals come with choice of side and a drink. We stuck with fries because otherwise she’d be begging for ours. To drink, we just stayed with water. J ended up eating half of L’s grilled cheese while L ate the other half plus most of her fries. 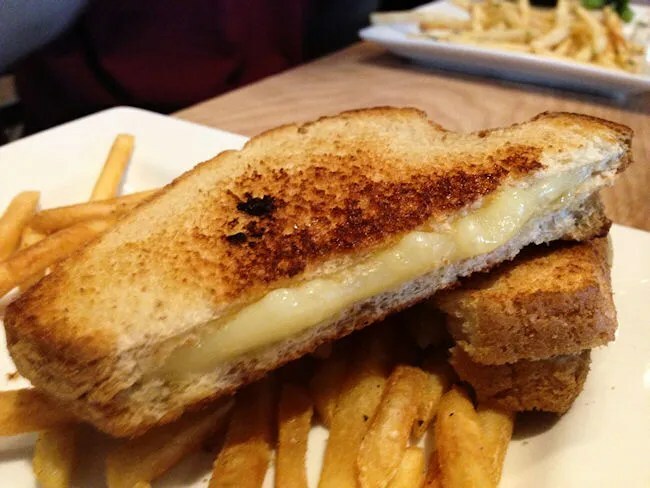 It’s a simple grilled cheese, but a delicious grilled cheese. 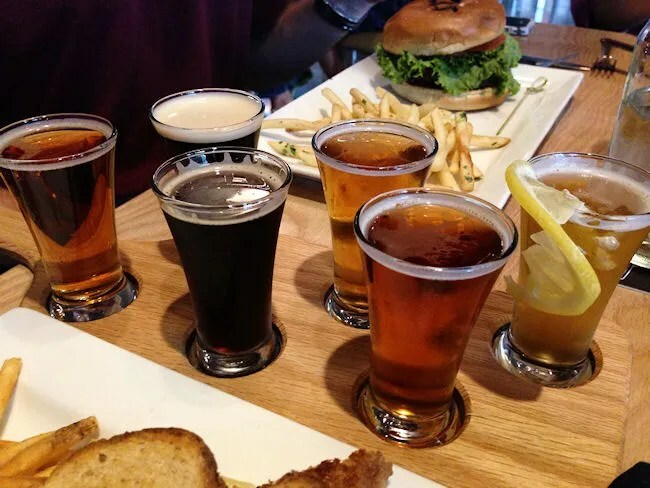 Before finishing up the meal, the co-worker of J’s who was drinking beer asked if I wanted to split a flight with him. Of course I did. I was thinking of doing that on my own, but it always feels weird to do flights with meals. We got to try almost all of their beers by the time we added in the three that we were already drinking. The bill for J and I came out to a little over $35 (I didn’t pay for the flight). Latitude 42 has been working to build hype for their place for several months now and social media. J and I totally bought in. The one thing J kept saying is that they were so polished for an opening day. No service issues. No food issues. It’s like they’ve been open for a while. Latitude 42 is a pretty polished brewery. It’s not the afterthought taproom of a successful home brew operation. 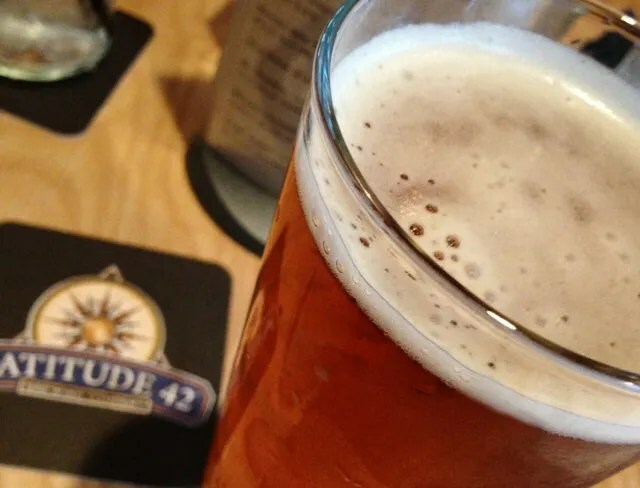 Latitude 42 reminds me a lot more of a Rock Bottom type of brewery. They seem to put equal emphasis on food and beer which makes everyone happy. It’s the kind of brewery that you can take your family too and not feel out of place.